Today I will be reviewing the hair extensions by Irresistible Me. If you happen to follow me for a while now, you know that I have always had long hair. I decided to chop it off to a long bob. I was happy with the results but sometimes I miss having long hair. Therefore I was excited to have the opportunity of working together with Irresistible Me. In the pictures above, I am wearing the Royal Remy 200 grams, 24 inch, Chocolate Brown, real human hair extensions. When I had received the extensions, I was excited about the colour because it fit perfectly with my own hair. The hair feels very soft and I was surprised it was really thick. So after unpacking the extensions (they sent it in a very nice package), I clipped them in. The extensions are easy to clip in and apply to the hair, and voilá after 20 minutes I was done. You can style them easily with your straightening iron, or curl your hairs to get a neat look. If you like having different haircuts or mis your long-hair like myself, I would recommend the Irresistible Hair by Irresistible Me. 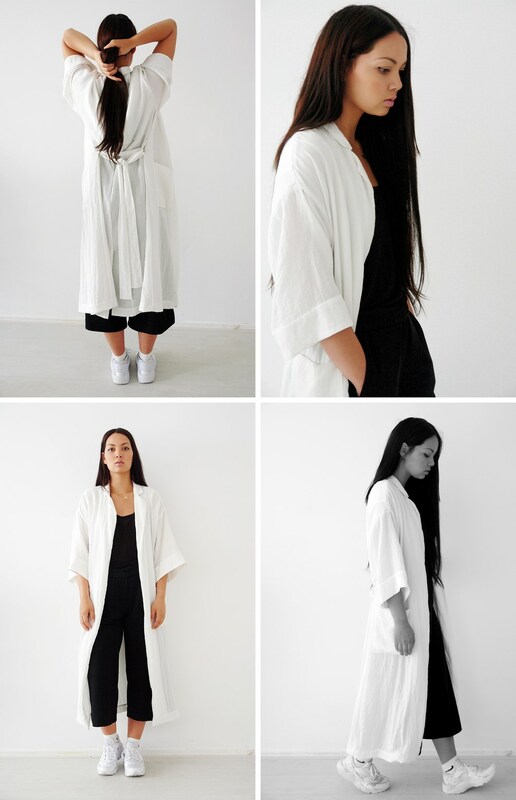 Wearing: Weekday Kimono, Nike Huarache, Nike sport socks, H&M Trousers. Ziet er echt mooi en natuurlijk uit!